That’s right. Get your 3-D glasses out, because your mind is going to be blown. You think a band like Phish, who has been living off of tripping people out with their groovy music and crazy light shows for years, cannot push the envelope any farther. C’mon, it’s Phish. They live for this sort of stuff. Coming this April, Phish3D will be hitting movie theaters across the country. Phish 3D was filmed at Festival 8, the bands 3-day festival which took place over Halloween weekend 2009 at the Empire Polo Club in Indio, Ca. Phish 3D will take some of the best performances from the band’s eight sets that weekend, including a special acoustic set and a set where the band dressed up in costumes and covered The Rolling Stones’ album Exile on Main Street. Since 3-D movies is the new popular trend in the movie industry, few bands have gone third dimensional. One of the first 3-D band movies, Larger in Life in 3D, featured Dave Matthews Band, Ben Harper and Relentless 7 and Gogol Bordello perform last year’s Austin City Limits Festival. Now Phish will take on the challenge, and judging by their history, this movie should be a success. 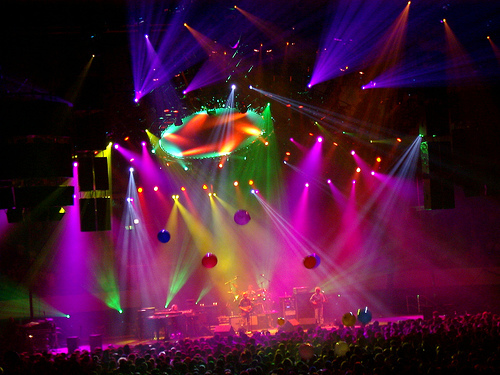 Phish3D is going to be a crazy experience for die-hard Phish fans and music fans in general. If you like music that will make you dance, light shows that will blow your mind and 3-D, I suggest you don’t let this opportunity pass by.